Deaf dogs: various foster Boxers. Other pets: Savannah and Jordan. Deaf dog: Zachary, a 6 year old Dalmatian. 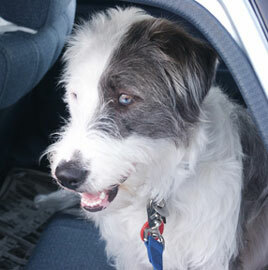 Zachary is a mellow, playful, fun dog who just loves everybody. Other pets: a similarly mellow 8 year old female Dalmatian who acts as Zachary's ears. She and Zachary make a great team. Deaf dog: Salty is an 8 month old Jack Russell Terrier. Salty Dog has hiked with me all over the Sierra Mountains. He showed up on my porch one afternoon, saw me, and then did the "dance of joy". He is my constant companion. People enjoy meeting him and are especially interested when they find out that he is deaf. 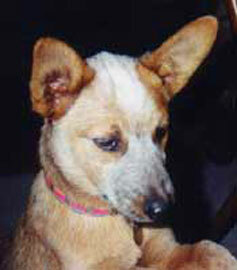 Deaf dog: Ekko is a two-year old Australian Cattle Dog. She came to me as a rescue dog at 8 weeks old. I was going to foster her until we found her a good home. We did, ours. Neither my other dogs, my friends or myself could part with her. She is the sweetest, most loving, smartest little girl you could ever want. We are going to be working on some agility with her since she is so active and can leap like a gazelle! Other pets: Jodie - 12 year old SF pembroke corgi, Taylor - 7 year old SF choc. lab, TS - 3 year old NM border collie mix, various foster dogs here and there. Human companions: Teresa describes her family: "My mother is a special ed. teacher at a grammer school. My father is a traing manager at a major winery. My older sister that lives with us as of right now is also a special ed. teacher. She also specializes in working with deaf and hard of hearing children. I am a high school student and aspiring jazz musician (but if that doesn't work out I would like to work at either Sea World of San Diego or the San Diego Wildlife Park) =)"
Other pets: We have three cats: Snowball, Lucky, and Smokey. We also have a parakeet named Sweety and quite a few fish in the house and in the backyard in the ponds. 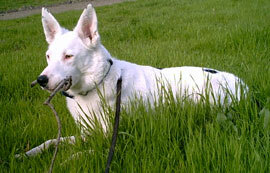 Deaf dog: Oscar is a Border Collie. He is excelling in obedience and agility. He loves everyone, especially children. The only training issues we have had stemmed from breed characteristics, and side effects form food allergies. Other pets: Two other dogs. 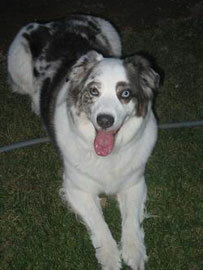 Deaf dog: We have been owned by Dolly (Australian Shepherd Blue Merle) ever since she was 8 weeks old. We rescued her from the Oakland SPCA through Hop Along, She has been the joy of our lives ever since. We started taking her to training classes at the Santa Clara Fairground when she was three months old on Wednesday nights. We have learned a lot from the wonderful instructors several of them have experience with deaf dogs. We are teaching her hand signals and she is teaching us that having a handicap does not limit almost anything that she wants to do. Our next class will begin on the 14th of Aug, 2002 and will be a C.G.C. class. We have just begun and love every minute of it. Other pets: Three cats: Samantha, Sunny & Cheesy. Deaf dog: Kisses (American Cocker Spaniel) is a wonderful dog. She will chase a tennis ball with energizer bunny enthusiasm. I rescued her from the sister of a co-worker who was going to put her in the pound because they were moving and didn't want to travel across state with a dog. Some people! She learned obedience hand signals when she could hear and I have used those and added a few more. She now has a wheelchair because her back legs have gone out on her. Getting old is a bummer! But she is still enjoying chasing the ball! She is wonderful to have around. She follows me everywhere and goes everywhere with me. She is definitely a Mommy's dog. 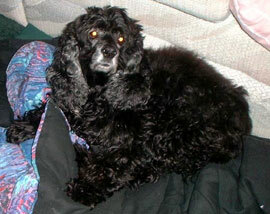 She is very affectionate and lives up to her name by giving out lots and lots of kisses. Other pets: Kisses rules the house over my 3 yr old male American Staffordshire Terrier, Ares and my 3.5 yr old pit bull (shelter rescue) Doesha. And she tolerates the cat, Noge. Deaf dog: We adopted "Blue" ( a Bearded Collie/Australian Cattle Dog Mix, born 2002) from the local animal shelter when she was 11 months old. You can see Blue at her web site. 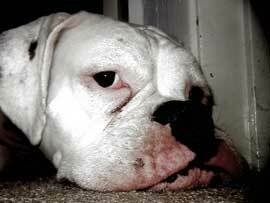 Deaf dog: Wednesday is a white boxer, born in 2002. We rescued her after she had been hit with b-b bullets because someone thought she was not listening. We just got her (July 2003). We have 2 other Boxers around 2 yrs old. Have had her only one night and we love her. She is very sweet. Any help would be appreciated. Deaf dog: Dotty is an 11 week old Great Dane. "We bought her from breeder, and we were unaware of the risk of deafness with a white, blue eyed dane until after we got her. She was a cuddle bug of 5-1/2 weeks when we got her - skinny, skinny because her mom ran out of milk and her 'brother' was FAT! She bonded so easily with us all and is so feminine looking with her pink nose and blue eyes." Other pets: Hank, a 5 year old black male Pug. Deaf dog: Tyson is a 8 week old Boxer. "Tyson is such a sweet boy. We got him 2 weeks ago and I am so in love with him. We got him from a family that owned 2 boxers and the female had an accidental pregnancy. They did not know he was deaf, they just thought he was a heavy sleeper. It didn't take us long to figure out he was deaf, but it doesn't matter to us. We know he will just take a little while longer to train than a hearing dog, and we are up for the challenge!"